We are designed through evolution to protect and further ourselves. While this is universal, if you look closely at your life, you might find that the navigating ego goes beyond the call. Have you noticed how many life moments are devoted to navigating obstacles and solving problems? How often your mind is worrying about something, anticipating what’s around the corner, preparing for what might go wrong? I call this mind-set the Over-Controller, and the more we feel threatened, the more the Over-Controller is on duty. The suffering comes when our effort to be in control becomes chronic and we forget who we really are. The Over-Controller is addicted to doing. 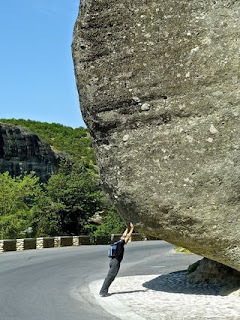 An image that comes to mind is Sisyphus pushing the boulder up the hill and then just watching it roll down over and over again. When we’re pushing the boulder — pre-occupied, straining to get somewhere else — we forget the consciousness, the tender heart-space, that is right in every moment. Identified as a human doing rather than a human being, we miss out on feeling fully connected and alive. If you want to find the expressions of the Over-Controller in your life, look to the places where you are most stressed. That is where the Over-Controller jumps out in most vivid form. When we are in control mode, we judge and try to manipulate ourselves and others into being different in some way. The result of regular overdoing is chronic fatigue, even exhaustion. There is no room to breathe, no rest. We lose access to our own creativity and natural intelligence. We can’t feel our own loneliness or sadness or yearning because the Over-Controller is not living in the present moment. The most obvious flag of the Over-Controller is obsessive thinking, with a fixation on perceived problems: There is a problem here. Things should be different. You should be different. I should be different. “Should” is a word that the Over-Controller lives on, and whenever there is a should, it is an argument with reality. The need for certainty and the clinging to strong opinions and views inevitably leads to a deep suffering of the Over-Controller: conflict with others and conflict with ourselves. Sadly, our fear-driven effort to control life creates separation from even those most dear. How do we relax the Over-Controller when we are most activated and stressed? How do we shift from being inside the identity of a controlling, wanting, fearing self into a compassionate witness that can see what is going on and knows how to rest and just be? The first step is that we have to intentionally recognize the Over-Controller in action. Then, the trick is to relate to the Over-Controller not from the Over-Controller. This fear based part of your evolutionary inheritance is trying to help you, even though not in the most strategically wise way. If you can witness and relate to it from a space of compassion and presence, then you can loosen the identity. A metaphor that may be helpful for some is to imagine that you are in a row boat, rowing desperately and exhausted by the intensity of the currents. You are feeling both like the victim of the winds and also the controller trying to make it through. Now compare that with pausing for some moments, putting aside the oars and allowing the sail of presence to unfurl. While the winds are out of our control, ultimately they carry us. One woman, a busy, stressed executive with a young son, was often trying to keep to a very tight schedule and would impatiently push her son to hurry up: “Eat your breakfast! We have to get you to child care!” Or: “We’ve got to shop really quickly and get home!” One day, she was diagnosed with a serious malignancy and she learned that had a year to live. She described how that shifted things and her mantra became: I have no time to rush. It gets very clear, when we are facing the changing seasons of life, that the love and homecoming we seek is only available in moments of being. In the space of this open presence, the light of the universe shines through. Intuiting this, our longing and commitment deepens to relax the Over-Controller. Just as it’s natural to get addicted to controlling, it’s part of our evolutionary potential to witness this and awaken from the trance. If we can bring curiosity and humor — Oh, there it is! Obsessing on problems again! 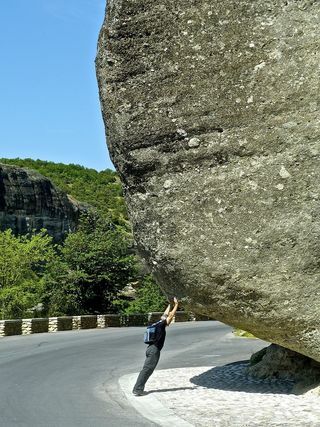 Pushing the boulder! Thinking things should be different! — without adding judgment, then we create some space to let go of the doing and just be. In that space, we remember the truth and vastness and mystery of who we are. “Settle in the here and now. Faulds, D. (2006). Awareness Knowing Itself. In From Root to Bloom: Yoga Poems and Other Writings (p. 17). Kearney, NE: Morris Publishing.